The first meeting of the Friends of Queens Park which has taken over from the Stakeholder took place on Tuesday night with a trip around the park to see the progress led by Ian Bright, from EBM consultants. A lot turned up despite the bad weather and darkness. 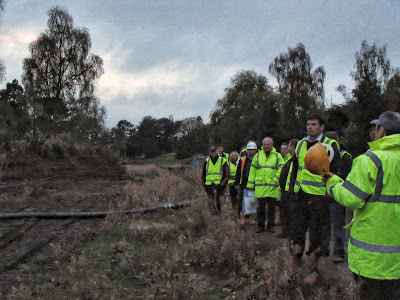 We were shown the new roadway being built by the lake as a temporary measure so heavy machinery can move about the park such as diggers and cranes. We were then shown Broad walk and the band stand. Most of the path is full of heavy machinery and work has been done on the main bridge which will span the valley to Coronation Walk. The heavy wooden bridge will be supported by a large arch and this time it will be level with steps on one side and a disabled ramp on the other so people can get to Coronation Walk. It will all be replanted. Work on the lake has been mostly about Burma Island this week with the surrounding brickwork knocked down and the soil removed ready for a rebuild. Down at the lake work was being done on Burma Island and down by the sluice gates. Wrekins display boards were being removed at long last. So people can now go down to the park and see some action at last. Its been a frustrating time for all and tempers have frayed with no work since early this year. But at last we can see work being done. Check back for updates.